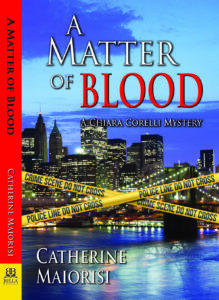 A Matter of Blood, the first in the Chiara Corelli Mystery series is my first full-length mystery and I’m really excited to share it with readers. 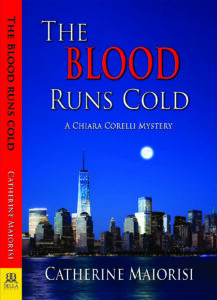 The book features NYPD Chiara Corelli and her partner/bodyguard Detective P.J. Parker. Corelli is being ostracized by the men and women in blue for exposing a ring of dirty cops. Parker, the daughter of a vocal critic of the NYPD, is shunned by her colleagues. Corelli doesn’t think she needs a bodyguard. Parker doesn’t want to work with the most hated member of the department. Neither of these two tough women wants anything to do with the other, but each makes a contract with the devil in order to get what she wants-homicides. They come out fighting – each other. But with Corelli in the lead and Parker watching her back they solve a brutal murder, keep Corelli alive and protect Corelli’s family from threats intended to shut her down. Winners will be drawn on May 29, 2017. Of course if you can’t wait, No One But You is available for purchase on www.bellabooks.com, Amazon and Barnes & Noble. Most of my romance novels and short stories are triggered by something I see or hear or read or dream that generates narrative or dialogue in my head. Walking around during the day or waking up in the middle of the night with these sentences and conversations buzzing in my mind can be a little crazy making. The only way to clear my thoughts is to write down as much of the story and the characters as I know at that time, give it a name, and put it aside. I currently have about thirty-five of these in various stages-snippets of dialogue, pages of actual writing, or just notes on how I think the story should go. From time to time, I’m drawn back to complete one. I’m not sure of the source of the idea for No One But You, my recently released full-length romance, but it started as one of these, as a scene in which Robin and Lily are breaking up. Strangely, even when I created that scene and filed it away, I knew it was a romance and it needed a happily ever after ending, not a divorce. When I actually started working on No One But You, the only things I knew were the names of the characters, that they had a child and were breaking up. It appeared to be the end of the story but then it couldn’t be a romance. Or could it? As I developed the backstory for each character and the story of how they’d arrived at this point, I realized the breakup scene was the middle of the book not the end and I needed to explore the story of what happened after they broke up. I call this part of the writing process “world building” because by the end of the book I’ve created the physical, emotional, cultural, and psychological world of the characters and woven them together into a story. It’s never a straight line from beginning to end and there’s always a lot of deleting along the way, but I love letting my imagination go free. Choosing the location for the story was a non-issue. With the exception of a few short stories set in Provincetown, everything I’ve written up to now has been set in New York City where I live. Most of No One But You is set on the Upper West Side where Lily lives and in Battery Park City in lower Manhattan near the World Trade Center where Robin lives, but Lily and Robin also visit Coney Island in Brooklyn and the Highline. Although my first romance, Matters of the Heart, required research on heart surgery, the research for No One But You was a greater challenge because the story involves in vitro fertilization (IVF), premature babies and postpartum psychosis, issues that I knew little to nothing about when I started. Luckily, I enjoy reading about a wide range of topics so research is not a hardship. I found many articles on all three issues on the various medical websites and the New York Public Library was a great source of books on the topic. My goal was to include the information required to flesh out the story and the characters but not include so much that it overwhelmed the reader. No One But You is about what comes after the happily ever after. I love these characters and this story and I sincerely hope readers will too. That’s me, Catherine Maiorisi. Well, I’m not really a new writer, just a newly published writer. And even that statement is not correct because while Matters of the Heart (Here) is my first full length novel, I have had romance and mystery short stories published (Here). As you may know, Matters of the Heart is a romance. But you may not know, I’m relatively new to the genre, both as a writer and a reader. It happened by accident when I wrote a short story as an exercise to develop the backstory of the romantic interest in my Chiara Corelli mysteries.The story turned out to be a romance and was published in the Best Lesbian Romance of 2014. That short story, “The Fan Club,” sparked my interest in lesbian romance and, as is my way, I began to read voraciously to educate myself. I quickly gravitated to authors like KG McGregor, Georgia Beers, Karin Kallmaker, Carson Taite, and Gerri Hill for the quality of their writing, characters, and plotting. I’ve since found many other authors whose work I appreciate. On average, I read about four lesbian romances a week and I learn more about the craft every day. In the meantime, I have continued to write and publish. My $1.99 standalone eStory Come As You Want to Be can only be found at bellabooks.com. Another short story, “You Will See A Stranger” is included in Happily Ever After, a Bella anthology of romantic stories written by twenty-three Bella authors. And my second romance, No One But You, will be published by Bella Books in March 2017.